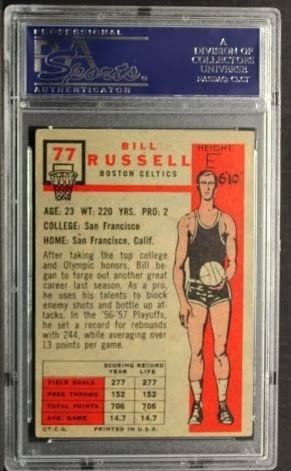 Baseball Card News by DeansCards.com: 1957-58 Topps Basketball Complete Set. 1957-58 Topps Basketball Complete Set. 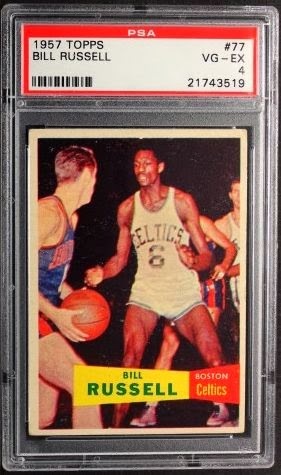 The 1957-58 Topps Basketball Complete Set is considered to be a fairly scarce set. Even though it is scarce we have managed to build one. The1957-58 basketball season consisted of 8 teams that were divided into two divisions. Even though the color barrier was broken by then, ( due to Jackie Robinson), the set still only has a total of 10 African American Players. The set also features 21 Hall of Famers which include Bill Russell, Bob Cousy and Bob Pettit. Nearly all the players in this set are a Rookie card because there had not been a major basketball complete set since the 1948 Bowman Basketball Complete Set. It is very hard to get this set in a high condition. The condition that we currently built is in Excellent. The reason it is hard to acquire in such a high condition is due to the fact that when these cards were sheeted they were often un-centered and were printed with a snowy background. As a result of bad centering and printing some backs of the cards are printed upside down. The players on the cards are featured in the vintage uniforms of the time. The shorts were shorter back then and the tanks were tighter. Some of the cards feature multiple players in the background or faded out crowds of people. The back of the cards feature the players biography, statistics and even had a generically draw basketball player. As mentioned earlier, some of the backs were upside down. This set will make a great addition to any collectors set. If you have any questions about this set or any of our vintage sets, please be sure to contact us. Dean's Cards offers a 100% Money Back Satisfaction Guarantee on all purchases. Just contact us within ten days of the purchase date and we will refund your money or, when possible, replace the cards. Dean Hanley, founder and owner of DeansCards.com, is considered one of the foremost experts on the subject of vintage baseball cards, other sports and non-sports cards and has a regular column in the Sports Collectors Digest and publishes articles on his blog. Dean has also written two books on vintage sports cards: The Bubble Gum Card War: The Great Bowman & Topps Sets from 1948 to 1955 and Before There Was Bubble Gum: Our Favorite Pre-World War I Baseball Cards. Both are available in eBook and paperback form.